The topic of Seminar 2014 is “Ready to Conquer AFTA (ASEAN Free Trade Area)”. 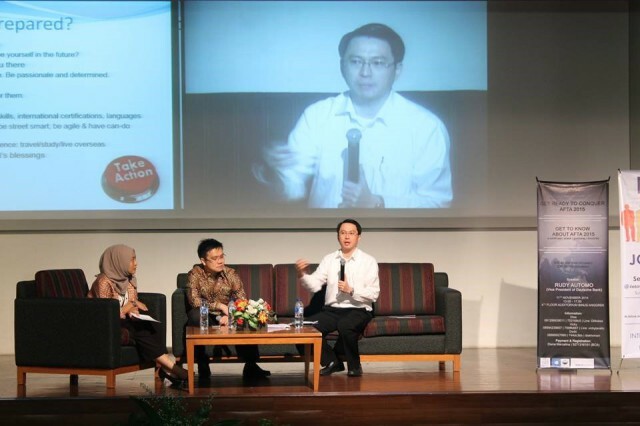 This seminar was held on November 11th at Binus University Auditorium. The speaker of this seminar is Mr. Rudy Automo (Vice President of Deutsche Bank). The speaker was explaning about how to face AFTA in 2015 and shared about his personal experiences. The purpose of this seminar is to enrich the insight about AFTA and to prepare the strategy to face AFTA in 2015. This seminar was organized by 25 students and was attended by 228 students from Industrial Engineering Binus University, 170 students from Binus University other major, and 19 students from other university.